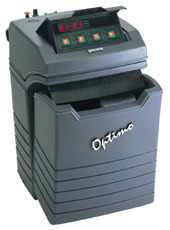 Vista, Calif.-based BWT USA offers a new solution for the water treatment professional—the “Optimo” water softener. By integrating fine mesh resin with a unique brine distribution system, this compact softener regenerates on demand with only four gallons of water and 2/3 lb. of salt. It can save hundreds of dollars in salt and water usage. Its environmentally friendly specifications meet all federal and state brine regulations with flow rates up to 8 gpm.